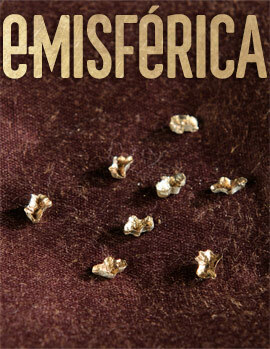 e-misférica invites artist/activist presentations, review essays and reviews (books, films, performance, visual arts) for its Summer 2012 issue, entitled On the Subject of Archives. More than a repository of objects or texts, the archive is also the process of selecting, ordering, and preserving the past. But in recent years, the term “archive” has become increasingly capacious, interchangeable with “save,” “contain,” “record,” “upload,” “preserve,” and “share” and with systems of organization such as a “collection,” “library,” “inventory,” and “museum.” “Archive” in the digital age seems to magically transcend the contradictions between “open” and “closed,” democratic and elitist, the curated selection process and the do-it-yourself upload. But have the logics of intelligibility shifted to bring the unspoken and the unthought into public awareness? How have the power structures behind archival practices been transformed through technological and creative innovation over the past decades? What are the continuities that persist in the present? How have the boundaries between archival subjects and archival objects been reconfigured in the process? Do “live” acts, such as performances, resist the archive? Or does the archive produce its own special kind of performances? This special issue of e-misférica explores how scholars, artists, and activists throughout the Americas are using and theorizing “archives” to rethink the politics of what is saved (remembered), and what is discarded (forgotten), and in the process redefining the representational forms through which the unthought and the unspoken are made intelligible. This entry was posted in Archives, Waste. Bookmark the permalink.